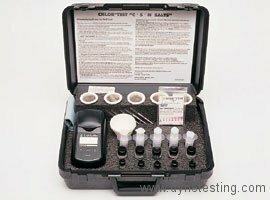 Designed to accurately, measure surface chloride, sulphate and nitrate ions in minutes, the Chloride, Sulphate & Nitrate (CSN) Kit offers a single kit solution for testing in the field. All the components of the CSN Test Kits are pre-measured and pre-dosed for trouble free testing. Results are recorded in parts per million (ppm) requiring no complicated calculations. CSN tests are all designed to use a ratio of 1:1 for easy conversation to µg/cm². Refill kits are available for all consumables.